Imagine you are very, very old like this woman. Imagine your whole life, ever since you were a little girl, being treated as an outcast. Imagine never knowing your Dad is proud of you. You cause him endless grief because there is no way he can pay the dowry some man will require to marry you some day. Imagine being ashamed because you were a girl. You have always felt worthless, helpless, and desperate. Your own family is starting to nudge you out of their lives because you can’t work as hard or long as you used to. You gave all you and family ever earned working morning to night in a rice field to the gods. The family gods never gave anything back to you except this life of despair. Then, imagine a woman coming to your village. She doesn’t wear the markings on her forehead of one who has visited the temple. She doesn’t wear the bindi, the sacred third eye in the middle of her forehead either. This woman is different. She smiles when she looks your way as you wash your clothes in the river. You see her while you are in the market, and she is talking to a group of women. You step in closer to hear her, and you realize she is talking about Jesus. A new god. He loves us? You have never heard of a god of love. The woman visits you in your thatched roof hut. You have never had any visitors. You are embarrassed because you have no tea to offer her. The woman smiles. She offers you Jesus instead. You accept him as your God. No other god has loved you. You have lost all already. Suddenly, you feel peace. You know love, and joy is your surrounding. Nothing around you has changed except for the invitation of this new God to be your one and only God. You choose to be baptized. You sacrifice your standing in your family and village. They have begun to cast you out anyway. No one has loved you like Jesus. Jesus is worth losing everything for. I don’t know if that is this particular woman’s story or not. Ryan Devries took this photo the other day at the baptism Rob took part in. 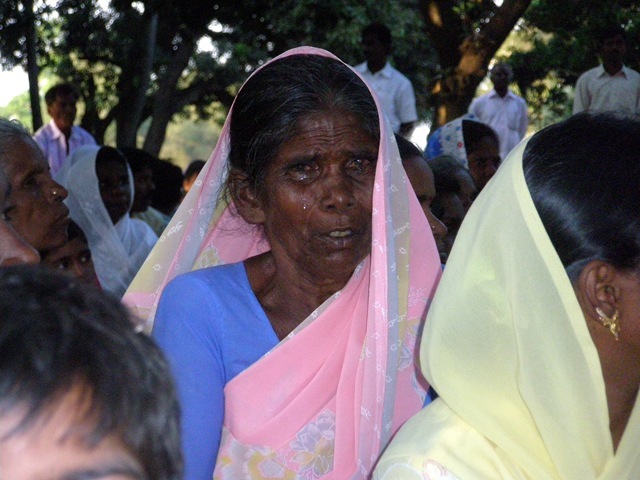 This story is the story of a hundred women I have met and read about in Southern India. The God of Love is reaching them and surrounding their lives with his joy, power and peace. To be a part of this story in some small way is one of the greatest honors God could ever give me. Beautifully written! And Happy Anniversary this week! Rob’s post about you was better than watching any chick flick. What a great model of a Godly romance you two are for the rest of us. Thanks for sharing, and have a great time in Chicago!